On February 15, 2018, the Pennsylvania Supreme Court received 8 map submissions for congressional districts. Each purported to fully comply with the court order to be compact and contiguous, generally equal in population, and split local governments only when absolutely necessary for population equality. In reality, all submissions failed to meet the standard of the court order. Although no map came close to meeting the court order, the Joint Republican and Senate Democratic submissions were the least bad. I will reference these two in citing examples. All the submitted maps universally fail the most important aspect of the court criteria of only including “absolutely necessary” splits. This is true by either split measurement. At a minimum, the submitted maps leave room for a 60%-69% reduction in the number of splits. And in all but the Senate Democratic and Lt. Gov. submissions, these split counts are low estimates. The other map submissions were not forthcoming about the numbers of wards they split, which is on the court criteria list. Even more absurd is that everyone found it necessary to split voting precincts. This is unbelievable considering districts exceed 700,000 persons, technological advances, and federal courts permit small strays from exact equality to accommodate a legitimate state interest like this. The practical implications of precinct splits are costly to the state and confusing to voters. It is noteworthy that the map by the Intervenors was the best at avoiding county and municipal splits but fell apart when it came to avoiding splits to voting precincts. All but one submission stuck with a zero deviation. The House Democratic map includes a couple of small population deviations. Because they failed to use these to avoid splits to local governments, federal courts would likely find it an impermissible use. There are multiple ways to score districts on compactness, but no acknowledged standard. The scoring methods are not perfect and can be used to justify some oddities. The Polsby-Popper method seems to be less subject to bias than some of the others. It creates a general gauge for levels of compactness, but should not be used with great precision. For submitted plans where this measurement was available, they all had the same average score. Each plan included a couple of low scoring districts. The visual oddities still remained. Both the Joint Republican and Senate Democratic map perpetuate the sprawl of the Philly-Delaware CD 1. On the Joint Republican side CD 18 makes an odd hook around Allegheny. On the Senate Democratic side, CD 2 joins the congressional district which stretches across Philadelphia into Delaware County. Both plans include a district with a large geographic spread on the northern tier of the state — CD 5 in the Republican version and CD-10 in the Democratic version. Leaving behind the court criteria, observation reveals choices which are key drivers in shaping each of the maps. Many of these choices relate to which counties are grouped together or what parts of a county are grouped together. 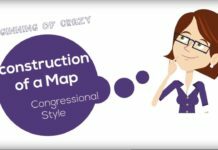 While perhaps not obvious to the casual observer, there are certainly underlying reasons for why it is important to each party that districts include certain groupings. This is why it is critical to limit these opportunities for manipulation and dilution. Only allowing splits when it truly is “absolutely necessary” is the surest way to protect the voice of the people and create impartial maps. Pennsylvania certainly did not receive a map which created splits only when “absolutely necessary” from the interested parties. Now the question remains, will such a map ever come? Hi Amanda. Great analysis as always. Any thoughts on Petitioners’ Map B? It seems to solve the geographic concentration of D votes without breaking any of the Court’s rules. I’m surprised we haven’t seen more maps that split Pittsburgh, especially from the Democrats. If every municipal split counts the same, unpacking CD14 seems like a no-brainer for the party whose votes are largely wasted there. To me, the Petitioners’ Map B violates one key aspect of the court order — it splits far too many counties, municipalities, wards, and precincts. Map B includes 32 municipal splits, which is more than any other submission (except Map A). It also, like other submissions, includes voting precinct splits, which is absurd.